The Canadian Mental Health Association, Ontario (CMHA Ontario) and the Schizophrenia Society of Ontario (SSO) are not-for-profit, charitable, provincial mental health organizations committed to improving quality of life for people living with mental illnesses and their families. CMHA Ontario has a mission to develop and provide public policy advice that promotes mental health and improves the lives of people living with a mental illness. CMHA Ontario has participated in the Accessibility for Ontarians with Disabilities Act, 2005 (AODA) Standards Development process, review process, and has consistently articulated the need to address mental health disabilities in the AODA standards and regulations. In October 2010, CMHA Ontario and SSO participated in the public review on the summary of the proposed Integrated Accessibility Regulation (IAR) under the AODA. At that time, CMHA Ontario and SSO issued a joint submission that supported the government’s commitment to enhance accessibility for people with disabilities, identified specific concerns about the proposed IAR, and requested changes to the proposed regulation. A copy of this submission is available online at:www.ontario.cmha.ca/submissions. As noted in that submission, the AODA presents an opportunity for the government to promote greater accessibility for Ontarians with mental health disabilities. People with mental health conditions face unique and often overlapping accessibility barriers and human rights issues as a result of their disability. They also often fall through the cracks of the health care system, and face additional marginalization related to inequities pertaining to the social determinants of health. CMHA Ontario and SSO acknowledge and support the changes made to the proposed regulation following the summary review period – including: the inclusion of organizations that provide facilities; some strengthening of the accessibility plans sections; requiring employers to proactively provide all employees with accessibility policies; and some shortened timelines for compliance — and encourage the government to continue to strengthen the proposed regulation before it is enacted to better respond to accessibility barriers faced by people with mental health disabilities. In this submission, specific amendments to the draft regulation are proposed in the interest of increasing the regulation’s potential to make a significant difference in the experiences of people with mental health disabilities. We understand that following this final public review period, the government has the option to enact the proposed IAR as is, or with final changes based on the public’s feedback. We also understand that the needs of various stakeholders need to be considered and balanced throughout this process. With this in mind, we urge the Ministry of Community and Social Services to implement the requested changes below in the interest of promoting greater accessibility for people with mental health disabilities. CMHA Ontario and SSO are concerned that Part III: Employment Standards under the proposed regulation will not apply to volunteers and unpaid individuals. By extending the IAR provisions to volunteers and unpaid workers, the government has an opportunity to increase the positive impact of the regulation on the lives of people with mental health disabilities, many of whom may engage in unpaid work at some time, often as a pathway to paid employment and recovery. The inclusion of volunteers and unpaid workers will also promote consistency with section 5 of the Code which states that “[e]very person has a right to equal treatment with respect to employment without discrimination…” The OHRC has indicated that this section is to be interpreted to protect anyone in a work-like context, including family members, volunteers and others who engage in unpaid work to gain employment experience, such as students on a practicum or individuals who are being mentored. Proposed Amendments: Amend Part III: Employment Standards to apply to both paid and unpaid workers, in alignment with section 5 of the Ontario Human Rights Code. We are also concerned that the Employment Standards section places the onus on the individual with a disability to identify potential barriers and request accommodation (for example, see Sections 23 and 26). This approach may itself act as an accessibility barrier as individuals may experience discomfort and safety issues when disclosing their disability, as is often the case with mental health disabilities. We support the revisions made to the Employment Standards section which will require organizations to proactively inform all employees of policies for supporting employees with disabilities, including those related to accommodation, and call for additional amendments of this kind. Proposed Amendments: Require organizations to routinely survey their workplace for physical, systemic and attitudinal accessibility barriers, to remove existing barriers and to anticipate and prevent future barriers. CMHA Ontario and SSO are concerned that because the AODA and subsequently the IAR remain primarily focused on reducing visible physical barriers at the individual level, there is a continued need to address stigma, systemic and attitudinal barriers that people with mental health and other disabilities experience. These barriers pose major obstacles to achieving full accessibility for all Ontarians. The current regulation could be strengthened by amending provisions for training to respond to this concern. Although the proposed IAR states that “[a]ll employees, volunteers, persons who provide services on behalf of an organization and persons who participate in developing the policies, practices and procedures of an organization, will be required to be trained on the requirements of the accessibility standards,” no guidelines are provided about the objectives , content or delivery approach for training. In addition, despite the overlap between individual and systemic accessibility barriers and the Human Rights Code, no training is required on the Code. Likewise, although prevention of attitudinal and systemic barriers is incorporated into the AODA, there are currently no provisions for comprehensive anti-stigma training. Promising practices show that stigma reduction initiatives are most effective when they are customized to the target audience and involve people with lived experience in the development of programming and delivery of training. 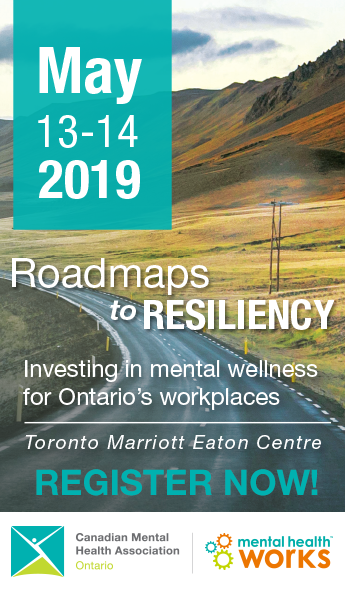 Mental Health Works is an example of a program that has been developed to address attitudinal barriers and facilitate accommodation of individuals with mental illnesses in the workplace (www.mentalhealthworks.ca). Proposed Amendments: Amend the proposed IAR to provide guidelines for the content and delivery of training, including requirements for content related to understanding and accommodating mental health disabilities, systemic and attitudinal accessibility barriers, and the Ontario Human Rights Code. CMHA Ontario and SSO are concerned that Part V of the proposed regulation could be strengthened through additional mechanisms for compliance and enforcement. Under the proposed regulation, compliance is reliant upon the accessibility reports that are submitted by organizations themselves to a Ministry-appointed Director. In addition, Part V of the IAR does not make reference to the inspections detailed in Part IV of the AODA. The IAR would be strengthened by including a process by which individuals may file complaints against organizations that are not in compliance with AODA standards and regulations. For example, while there are provisions which explain how persons or organizations that are found in contravention of the IAR can seek review of the Director’s decision, there is no specified parallel mechanism for individuals with disabilities to seek such a review. Similarly, because the final determination as to which accommodation, if any, is to be provided rests with the organization (see sections 12(2), 23(3) and 26(2)), the lack of an accessible complaints procedure for individuals with disabilities may create further barriers to accessibility. Finally, it is unclear whether complainants must contact the Director responsible for IAR Compliance Enforcement Initiatives, or whether they must take legal action or use mechanisms provided through the Human Rights Tribunal of Ontario. The establishment of a central advocate for persons with disabilities, such as an Ombudsperson for Disabilities, would greatly support implementation and compliance. Proposed Amendments: Increase resources to support compliance. Establish a procedure for individuals to file complaints about organizations that have not complied with the AODA, supported through a step-by-step plain language guide on the complaints process, a mechanism for tracking data about complaints, and a central body to advocate for people with disabilities, such as an Ombudsperson for Disabilities. CMHA Ontario and SSO encourage the Ministry of Community and Social Services to incorporate the proposed amendments to the draft regulation in the interest of promoting greater accessibility for all Ontarians, including those with mental health disabilities. Our previous submission, which offers a detailed discussion of our concerns, can be accessed online at:www.ontario.cmha.ca/submissions. We welcome this opportunity to work together to build a more accessible Ontario. Sheela Subramanian Planning and Policy Analyst Canadian Mental Health Association, Ontario 1-800-875-6213 x4157 ssubramanian@ontario.cmha.ca. Irina Sytcheva Policy and Advocacy Coordinator Schizophrenia Society of Ontario 1-800-449-6367 x255 isytcheva@schizophrenia.on.ca.